When I’m reading a novel I often wonder what the author was thinking as he or she was writing it. I wonder what life might have been like at the time. As I was looking for resources from writers about their writing I came across two unique journals that John Steinbeck kept when he was writing his greatest works. Working Days was his first journal he kept each day while writing the Grapes of Wrath. Journal of a Novel represents the combination of a journal and the manuscript for East of Eden (he wrote both in the same book). He used each journal as a warm-up and many of his entries had to do with setting the pace of his writing and slowing down his mind. It was a method he used to shake off his jitters before jumping into the prose. 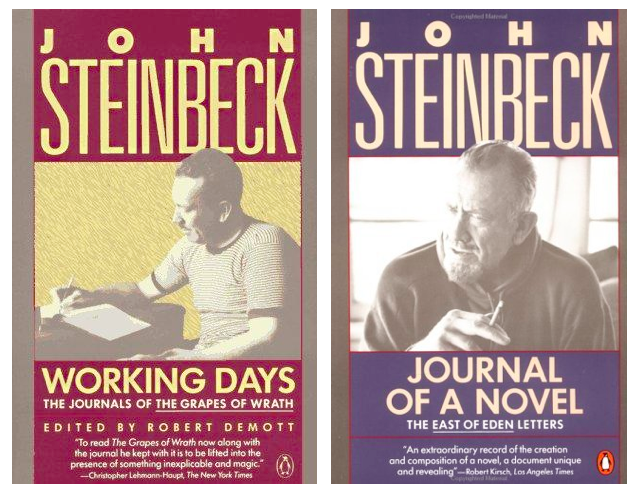 Even if you’re not a Steinbeck fan (which I am), these give you a window into the discipline of a great writer. Each day of the week and often some weekend days he would begin at roughly the same time each day (around 11) and put in solid hours of writing, even when he didn’t feel like it. For The Grapes of Wrath he gave himself 5 months to write, averaging 2,000 words a day. For East of Eden he wanted to give himself a full year and averaged around 1,000 words a day. He used the diaries as a means to focus. Each day he would start the act of writing by giving a short account of what was happening in life and then re-center his focus on the story and his task at hand that day. He did not like distractions, even the buzzing of an infiltrating fly. He talked a lot of keeping the world out and the books being the one thing he was responsible for. He and his first wife (there were 3) had constant visitors (Charlie Chaplin was a fairly regular visitor). He seemed to get most disturbed by the sound of the washing machine. More than anything, the journals were a daily pep talk that even if he didn’t believe he was good enough to write, there was a story to tell and he would do his best to live up to it. He often closed his journal entries after his writing wondering whether what he just wrote was good enough or not. He even referred to the Grapes of Wrath as “just another book”. I plan on adopting the journal idea as I take a stab at writing my own book. Thanks for this information. I like to read other people’s journal writing and how they have used it in their lives. Writing is not a very hard work to learn. To become a good writer one need to follow some rules. A good essay writer does not expect perfection with the first summary. Most of all I think that the golden key for good English essay writing is freedom of writing. You are currently reading A Writer’s Journal at 52 To Do.